TFSAs - how to maximise the value of the tax benefit? With three tax year-ends since the launch of Tax Free Savings Accounts (TFSA) in South Africa, many advisors and clients are still debating the best way to maximise the tax benefits of TFSAs. What has not helped much is that most product providers, including life companies, banks, unit trust management companies and LISP investment platforms, have jumped on the bandwagon and launched TFSAs over the past three years. This proliferation of TFSA product options, with the accompanying wave of good-news marketing material, have left many investors and advisors wondering how best to utilise a TFSA as one of a number of tax-efficient savings tools. In this article we will share some of the feedback we have received when discussing this problem with financial advisors, and highlight the implications of some of the different options available to investors. The media hype about TFSAs appears to have taken people’s eyes off the fact that the first savings priority for any investor should still be their contribution to a registered retirement fund (either through their employer or via a retirement annuity). As a rule of thumb, investors should first provide for an adequate contribution to their retirement fund before taking out a TFSA. With the recently increased income tax deductions available to retirement contributions, the potential compounded tax savings from a client’s contributions to a retirement fund early on in their career dwarfs the tax benefits on a TFSA. Secondly, investors should remember to use their annual tax-free interest exemption (currently R23,800 for individuals under age 65). At current money-market rates of just over 7%, and various other income funds offering close on 9% pa, an investor in South Africa can keep close on R300,000 in a fixed income fund before paying any tax on the interest earned. Ideally this allowance should be used to set up an investor’s emergency cash pool. When TFSAs were originally launched, many investors and advisors underestimated the extent to which the tax benefits on TFSAs would compound over time. This was because a TFSA contribution is not tax-deductible upfront like a retirement fund contribution, which makes it difficult to calculate the value of the tax benefit in rands and cents. In addition, the limits placed on the lifetime TFSA contributions for an investor has the effect of further delaying the real tax benefit to the time when the investor had used their full lifetime contribution allowance. The R500,000 lifetime limit is never increased, and contributions cease when this limit is reached. Assume a 10% pa investment return and inflation of 6% pa.
Further assume a roughly 50/50 split in investment return between interest and capital gain, resulting in an effective combined tax rate of 30% on total investment returns. 1 The investment return (the yellow bars) and the tax saving (orange line) take a long time to accumulate and only really become meaningful after about ten years. In the first five years the value of the tax benefit is incredibly small. 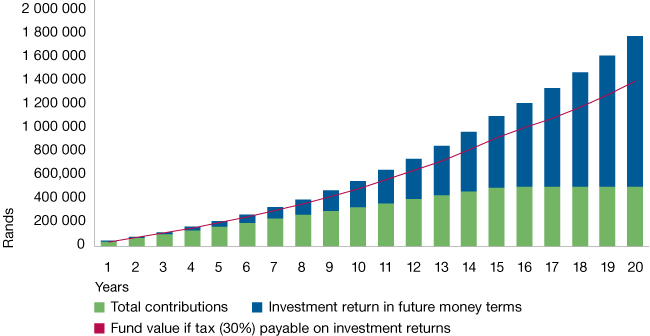 3 Yet after twenty years the tax saving represents over 20% of the total fund value. From a tax benefit perspective, it appears to not make sense for an investor to utilise a TFSA for an investment horizon of shorter than five years. This picture changes dramatically though after ten years due to the well-known compounding effect of long-term investment returns. Current TFSA product rules, as set out by Treasury, does not allow an investor to recover any part of the lifetime TFSA contribution limit should they need to dip into the TFSA assets to fund an emergency expense. Every time an investor uses part of their TFSA contribution allowance, that allowance is gone forever. Any redemptions from a TFSA therefore represent a waste of part of an investor’s lifetime contribution allowance – ideally something to be avoided. As highlighted above TFSA investments should be ten-year or longer investments, and portfolios should reflect this reality. Since TFSAs do not attract income tax or CGT, the risk/return characteristics of TFSA portfolios are neutral to whether returns come from capital gain, interest or dividends. Source: Morningstar Direct, as at 31.12.18. Performance figures are based on a lump sum investment, NAV to NAV, net of fees. Highest and lowest annualised returns since inception of the Investec Opportunity, Investec Equity and Investec STeFI Plus funds (12-month rolling performance figures) are: 43.8%( 31.07.05) and -15.7% (28.02.09) ; 65.8% (30.04.06) and -34.8% (28.02.09); 13.8% (30.06.01) and 4.2% (31.08.14), respectively. The total expense ratio of the Investec Opportunity, Investec Equity and Investec STeFI Plus funds (A class) are: 1.84%, 1.99% and 0.71%, respectively. Funds shown are for illustrative purposes only and are not necessarily the classes available on the IMS TFSA platform. The graph illustrates what most of us intuitively already know - more conservative portfolio choices merely reduce the likely long-term investment returns without really adding anything. Similarly fixed income investments, while they might appear attractive as they attempt to maximise the value of the tax saving, will also disappoint in terms of their total long-term investment returns. It seems that a good starting point for most TFSA investors is to have a look at South African unit trust funds from the “ASSIA Domestic Multi-Asset: High Equity” or similar category. These funds have historically produced very attractive long-term risk return trade-offs, and work even better when tax does not affect the structure of the investment decision. One can comfortably move even higher up the risk curve, especially for longer investment horizons. The most commonly selected investment option for the Investec IMS TFSA for example, has been the Investec Global Franchise fund. TFSAs are a great initiative from government to encourage savings in South Africa, and they are important tools for a financial advisor. However it is important to set them up correctly as long-term investments in order to maximise the value of the client’s lifetime tax benefit. All information provided is product related, and is not intended to address the circumstances of any particular individual or entity. We are not acting and do not purport to act in any way as an advisor or in a fiduciary capacity. No one should act upon such information without appropriate professional advice after a thorough examination of a particular situation. Collective investment scheme funds are generally medium to long-term investments and the manager, Investec Fund Managers SA (RF) (Pty) Ltd, gives no guarantee with respect to the capital or the return of the fund. Past performance is not necessarily a guide to future performance. The value of participatory interests (units) may go down as well as up. Funds are traded at ruling prices and can engage in borrowing, up to 10% of fund net asset value to bridge insufficient liquidity, and scrip lending. A schedule of charges, fees and advisor fees is available on request from the Manager which is registered under the Collective Investment Schemes Control Act. Additional advisor fees may be paid and if so, are subject to the relevant FAIS disclosure requirements. Performance shown is that of the fund and individual investor performance may differ as a result of initial fees, actual investment date, date of any subsequent reinvestment and any dividend withholding tax. There are different fee classes of units on the fund and the information presented is for the most expensive class. Fluctuations or movements in exchange rates may cause the value of underlying international investments to go up or down. Where the fund invests in the units of foreign collective investment schemes, these may levy additional charges which are included in the relevant Total Expense Ratio (TER). A higher TER does not necessarily imply a poor return, nor does a low TER imply a good return. The ratio does not include transaction costs. The current TER cannot be regarded as an indication of the future TERs. A feeder fund is a fund that, apart from assets in liquid form, consists solely of units in a single fund of a collective investment scheme which levies its own charges which could then result in a higher fee structure for the feeder fund. Additional information on the funds may be obtained, free of charge, at www.investecassetmanagement.com. The Manager, PO Box 1655, Cape Town, 8000, Tel: 0860 500 100. The scheme trustee is FirstRand Bank Limited, PO Box 7713, Johannesburg, 2000, Tel: (011) 282 1808. Investec Asset Management (Pty) Ltd is a member of the Association for Savings and Investment SA (ASISA). This is the copyright of Investec and its contents may not be re-used without Investec’s prior permission. Investec Investment Management Services (Pty) Ltd and Investec Asset Management (Pty) Ltd are authorised financial services providers. Issued, October 2017.